In South Africa, the locals call them the Amakwerekwere - a derogatory term for the foreigners who have come south in search of a better life, or who are fleeing political strife and economic hardship in their own countries. It is not clear how many foreigners have flowed across South Africa's borders since the transition to democracy in 1994, or what percentage are legitimate asylum seekers. Some analysts put the figure at anything between five and 10 million people. All that is really known is that a huge percentage of these are illegal immigrants. And in 2002 it was estimated to have cost South Africa R16 million over a period of two years to repatriate tens of thousands of the immigrants back to their home countries. However, what is certain is that the welcome South Africa extends to the foreigners is anything but warm. Newboy Sibanda is a Zimbabwean, who, like millions of others fleeing the economic and political disintegration in his country, came looking for work in South Africa in 1986. "When I had no papers the Zulus and policemen were treating me very badly," Mr Sibanda said. "Sometimes they were catching me and taking me to a corner and saying if I didn't have an identity number and no passport, then I must pay them. Buthelezi described asylum seekers as his "biggest headache"
"They were just putting their hands into my pockets and taking whatever I had." Sibanda added that he had encountered a xenophobic attitude in his adopted country. "They say we are coming here to take their jobs, but they are not doing the jobs," he said. "We come here to work and we work hard. You give us the job, we do it." Mr Sibanda took advantage of a government amnesty in 1996 which allowed him to legalise his status. 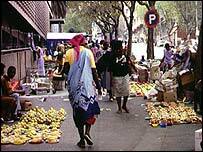 But hatred of the Amakwerekwere erupted in the streets of Johannesburg in 1997, when there were violent clashes between local street traders and competing foreign vendors. 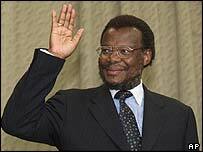 At the time, Minister of Home Affairs Mangosuthu Buthelezi described the influx of millions of illegal visitors as his "biggest headache". Abuse of the Amakwerekwere on the streets by South African citizens has been compounded by the frequent ill-treatment that both legitimate asylum seekers and illegal immigrants receive at the hands of police and officials from the Department of Home Affairs. In a survey conducted in 1999, the Human Rights Commission documented how government officials often deport individuals who have a legitimate claim for refugee status. Maria Angelica arrived with her husband from Angola in search of asylum but without any identity documents. "We were stopped by a policeman who asked to see our passports. I did not understand English. My husband told the Home Affairs officials we are refugees and they did not understand," she told human rights investigators. 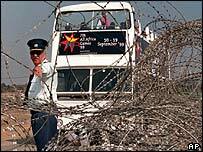 Lindela is South Africa's main repatriation holding facility ,where illegal immigrants are detained before being deported. It has developed a notorious reputation for the ill-treatment of detainees, in some cases leading to the deaths of those being held. Over the past year the law controlling immigrants has been changed, but its critics describe it as not much better than its predecessor, the Aliens Control Act. One thing is certain. South Africa's ordinary citizens are being forced to rub shoulders with Africans and other immigrants from countries in crisis - but they don't like it. How warm is Africa's welcome?